First, announcement! The last week of June, the lovely Ivy of The Ivy and I will be holding a joint Hauberk Week. Each day, we’ll feature the same hauberk, but on different models, with different dyes, accessories, and backgrounds. Maybe! Maybe our outfitting brains will be so in sync we’ll overlap! WHO CAN TELL. I am excited about this, and I hope other people will submit their cool ideas for the same hauberks on either or both of our blogs. Whee! I’m excited about featuring my friend Celeveren‘s character Aminah. Aminah is from Harad, which is not in itself unique. 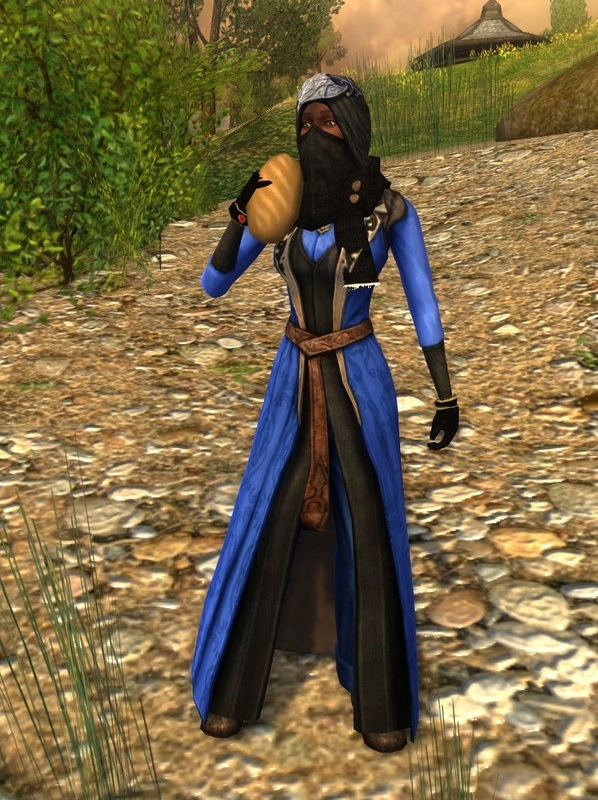 I’ve seen several people roleplay Haradrim, whether as villains, rebels, or unexpected allies. Aminah has taken it a bit further and posited different nations within the larger mass of Harad. Aminah’s suggested caption for this one was: Of course, there are disadvantages to checking out the Breeland food scene while veiled. But you do keep your girlish figure. 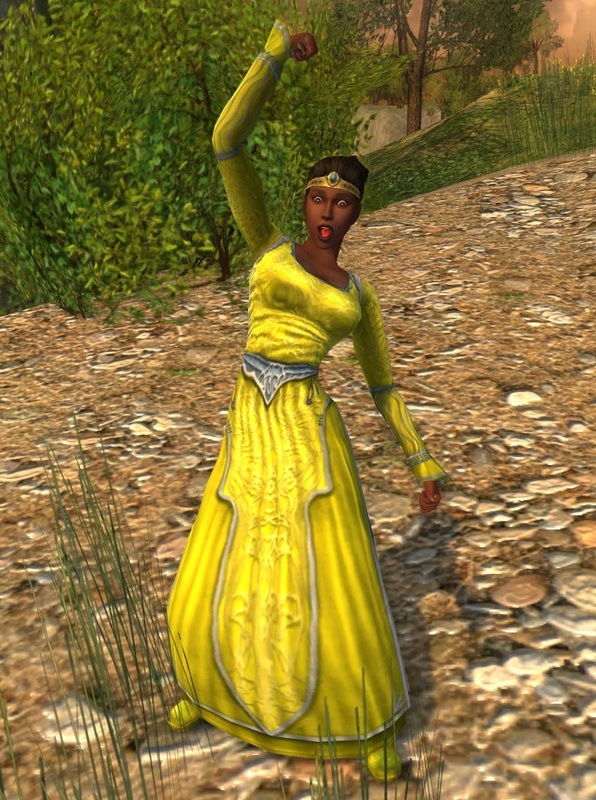 Again, from Aminah: Aminah’s husband, a Gondorian noble, gave her a duplicate of his circlet as a wedding gift. She wears it proudly, though not without some mixed reactions from her people and her in-laws. I AM THE ONLY TOON WEARING THIS COLOR! As always, if you have questions or comments for Aminah, feel free to comment, and I’ll make sure she sees them. Thanks, Aminah! 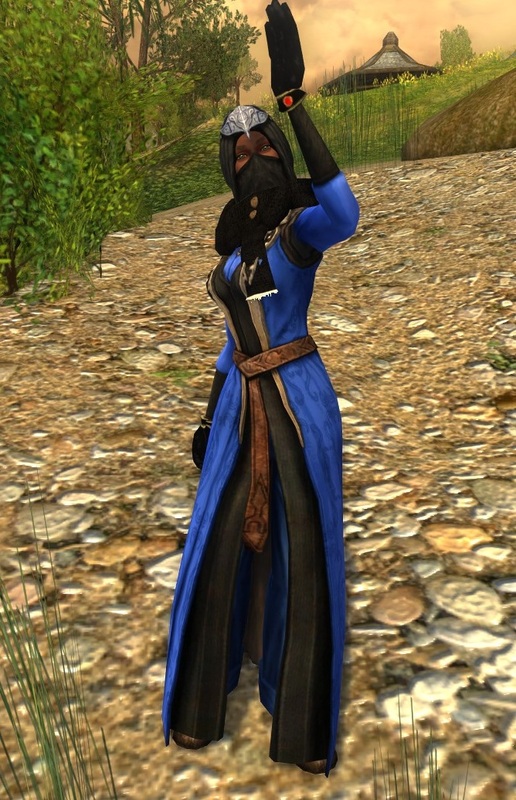 I never expected to see an arabian-inspired outfit in LotRO but this one work perfectly!